We have recently had a number of enquiries about how the NHBRC calculates the fees that have to be paid when a proposed new house is registered with them. In 2011 the NHBRC was deregistered for VAT and they adjusted their registration fees accordingly. 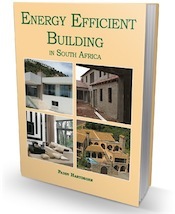 Every new home built in South Africa, since December 1999, must by law be registered with the NHBRC. No bank or home loan institution may lend money against the security of a mortgage bond unless the house is registered with the NHBRC. In addition to this the builder must be qualified, certified and registered with the NHBRC as well. In another article, NHBRC Suspends the Payment of House Enrolment Fees-PA003 we highlighted how the NHBRC is no longer allowing the registration fee to be bundled together with the first draw that the home owner gets from the financial institution – referred to as the PA003. This now has to be done at the time of registration or the house will not be accepted onto the NHBRC’s system. Here is a breakdown of how the fees are calculated. These are the older figures and we have left them in this post as they will give you an idea (on the right hand side) how the NHBRC goes about their calculations for the fees that they charge. We do advise you to check with your local NHBRC office for the most up to date figures. 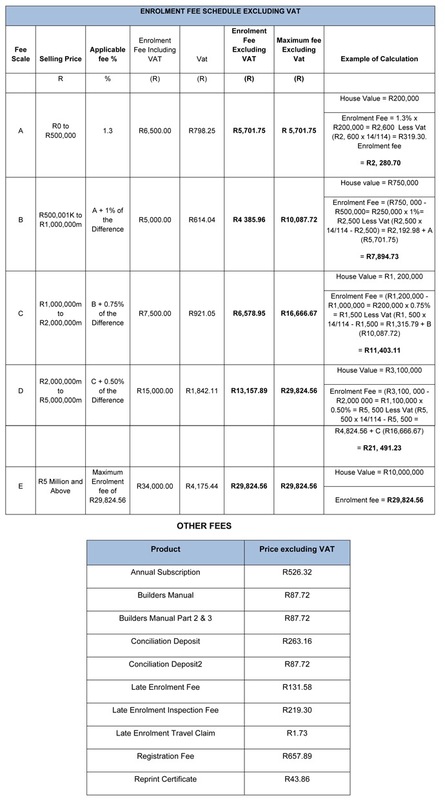 This table will give you a good idea as to how they have structured the fees and what you can expect to pay. I am about to start extending my existing house as soon as my Architecture completes the plans and registrations to the municipality.According to my architecture the site must be inspected and approved by an engineer before i can start and whose fees i must pay.I want to know if the engineer is still a must or necessary if i am using a NHBRC registered builder? Hi Brian, The NHBRC registered builder has nothing to do with your engineer and geotechnical site inspection. This has to be done in terms of the regulations and if fees have to be paid then this must be done. Can you please explain to me what the NHBRC is giving me when I have my house built through a registered NHBRC builder. Maurice, you should get the benefit of their warranty, but it’s irrelevant! The fact is that in terms of our legislation you have to have the house built by an NHBRC-registered builder or apply for an exemption as an owner builder. If your husband is a building contractor he should, quite frankly, know the laws as they apply to him. Every builder MUST be registered with the NHBRC and every house he/she builds must be enrolled. Only owner builders are allowed to apply from an exemption – i.e. not to enrol their house – and they have to do a test to show that they are knowledgable enough plus are not allowed to sell the house for at least five years after completion. So basically your husband has been operating illegally! I have submitted my plan for enrollment, I have paid the money that was requested. Its been now 2months since I submitted the plan but nhbrs is failing to issue me with certificate. I asked what could be the reason was told engineer is not available. I am frustrated because I am paying lots of money for pinalties in an estate all because of NHBRC they don’t want provide me with certificate. please advise where I can escalate the matter because everytime when I call the number people seems to be clueless. I would go to an attorney! In order to enrol the property do I need to be NHBRC registered as an owner builder? Or can I just submit a plan, pay the fees and appoint a registered engineer and a registered builder? Only registered builders enrol houses. If you are planning to owner build, you need to apply for an exemption. This involves a multiple-choice test to ensure you know what you are doing. Plans go to the local authority – which is a separate issue. The only other option is for you to apply to the NHBRC for an exemption. You would then be classed as an owner builder and won’t have to pay the enrolment fee or use an NHBRC-registered builder. You will not though be able to sell the house for at least five years.